Bio-Blaze is a family-owned Belgian company founded in 2002 by Bart Lensink. 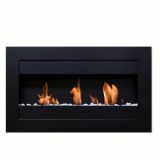 It aims to offer the market a range of revolutionary flue-less fireplaces. Bio-Blaze's products are assembled in our own Belgian and American factories, enabling them to offer safe products of the highest quality. 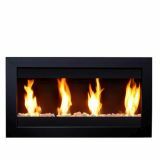 Bio-Blaze fireplaces and burners are all patented, tested, and safety-approved. No chimney! No gas! No smoke! This means that everyone can enjoy the warmth of a real flame. The Bio-Blaze fireplaces run on bio-ethanol fuel and do not need a chimney. They do not rely on any external connection (electricity or gas). The design of the fireplaces allows them to be installed both indoors and outdoors. Their natural yellow flames will instantly create a cozy atmosphere. In a condo, house or loft, on a balcony or in a garden, they can be easily attached to a wall, placed in an open space or put on a coffee table.Whether you want to renovate a fireplace or are looking for an out-of-the-box solution, Bio-Blaze offers you a wide range of innovative products designed to suit all your fireplace needs.